Local Fire are the fire protection specialists serving and protecting life and property. We exist to ensure greater confidence and compliance within business, strata and building management for the safety of our community. 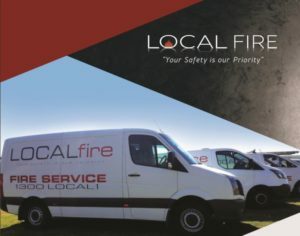 Local Fire is committed to providing professionally trained staff to service business, strata and the community according to Australian Standards to meet their fire compliance needs.. Honesty, integrity and reliability are the qualities we instil into our chosen team of highly skilled people. We deliver superior products at a reasonable price giving excellent value for money. Working smarter and using the latest technology gives us an advantage over our competitors. All clients, whether small or large, are all equally important and appreciated. Latest mobile technology for testing. Barcoding all your fire assets. Exclusive WEB customer portal for multiple sites.